With the holidays coming to a close, it’s a wonderful time to reminisce. Look back on all the fun times and experiences you had throughout the year. However, that can also bring up the not-so-fun memories: car odor. The smells that are inside your car may seem to only affect you, but that changes when looking to upgrade. That usually means trading in your current ride. What’s are some top tips to help you get your best 2019 car trade-in value? Let Car Odor Removal Companies Marietta GA show you! Purchasing a new car is a major life choice. That’s why understanding how to get your best car trade-in value is crucial to your buying process. 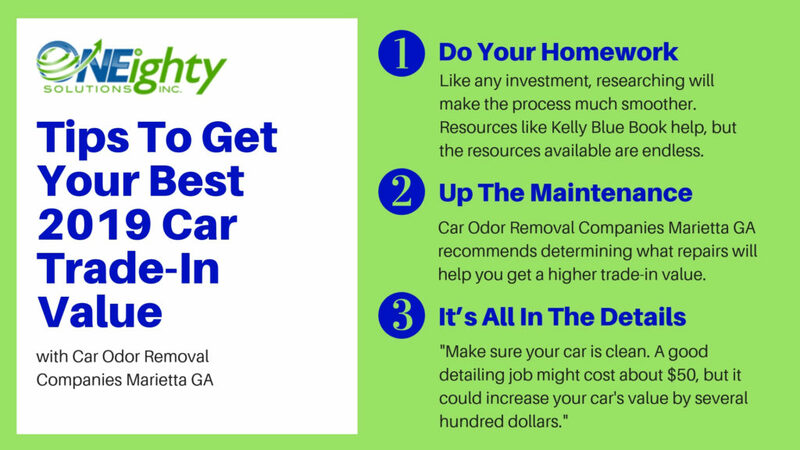 ONEighty Solutions, Car Odor Removal Companies Marietta GA, wants you to have the right tools to succeed in your car trade-in. Here are 3 tips to follow! Do Your Homework – Like any investment, researching will make the process much smoother. Understanding the current state of your car and the market can really make a difference. You want to know the current value and to see what similar vehicles are selling for in your area. Resources like Kelly Blue Book help with the value, but the resources available are endless. Up The Maintenance – Repairs and maintenance are priority when trading in your car. Car Odor Removal Companies Marietta GA recommends determining what repairs will help you get a higher trade-in value. A complete overhaul isn’t the best idea, so focus on the anything smaller to better the car’s condition. ONEighty Solutions takes being a leader in the Car Odor Removal Companies Marietta GA business seriously. We are IICRC (Institute of Inspection Cleaning and Restoration Certification) certified industry professionals. Our specialists are expertly trained to remove obnoxious smells and hazardous odors from automobiles the first time. Our one-of-a-kind, proprietary Biosweep, odor removal technology is eco-friendly, safe and fast. In addition, due to the lack of using harsh chemicals and strong solvents in our removal process, your automobile ends up smelling fresh and clean. That’s a surefire way to better your car’s trade-in value. We’re here as the experts to assist with your car odor removal needs. For a free evaluation, contact ONEighty Solutions at 678-506-2412 or info@oneightysolutions.com. For more on how ONEighty can be the solution to your situation, like us on Facebook and see what our customers have to say on Yelp.